I’m a 34 year old never-stay-at-home mom living in Charleston SC after growing up in Ontario, Canada. I love Charleston and everything about it, but I often get homesick for family, friends and real poutine (another story entirely). My two kids Robyn, 12 and Liam, 4 are as different as night and day and are both at points in their life where they are challenging and fabulous at the same time. We are currently dealing with the whole pre-teen drama and angst of Middle School with one and the ups and downs of autism with the other, but there are also the sweet, funny moments and pics that I share with you that make it all worth while. I also have a sweet hubby who is a professor at a local university and a new little boy on the way – due in November. All of that, along with blogging and a serious reading addiction keep me hopping! It’s a blog about being me – sometimes mouthy, opinionated and always right… actually it’s partly that and partly a little slice of family history, current issues, recipes and just plain fun! When I blog, I often talk about things in my life – my children, my family especially my childhood recollections, my grandmother’s memoirs that I’m helping to edit and occasionally my husband. I also do product reviews, book reviews and give aways for family friendly products and services. I started blogging to share insights and issues with my friends and it grew from there. I feature family friendly books, household products, food, childrens products and more. Most of my readers are other mom bloggers and online friends who I share common ground with… but I also have former students of my husband’s and many other readers. I would like to keep a balance of reviews, give aways and personal stories and expand my base by finding like minded bloggers to share with. Maintaining everything when I get sick or tired and life catches up! I enter lots of give aways – if I regularly enter give aways on certain sites, I keep a list of what I follow on that blog and how, so I can cut and paste things like I follow on GFC or I am a facebook fan into the comments. 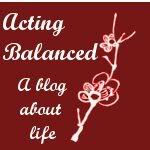 Acting Balanced is also one of the blogs participating in next week’s Fall Follower Giveaway Tour for $750!! thanks for featuring me Stacie!! For those of you planning to get involved in the Fall Follower Giveaway, I am one of the 15 participating blogs, so you can get a leg up by visiting and becoming a follower now, so you can be sure to get the bonus entries from surfing the whole list!